Nigeria coach, Stephen Keshi, has great confidence the Super Eagles can qualify for the second round of Brazil 2014 World Cup, saying his players are not scared of any team. The African champions were drawn into Group F alongside South American giants Argentina, Bosnia-Herzegovina and Iran. The Eagles open their World Cup campaign against Iran in Curitiba on Monday and Keshi insists his side are ready for the Princes of Persia. 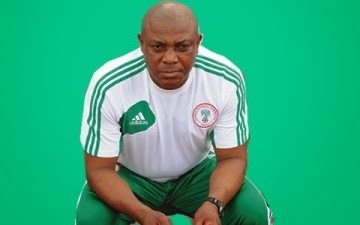 Speaking in an interview with Team Nigeria, Keshi said the team would also focus on other matches. The former Nigeria captain said, “There would have been no reason to take part in the qualifying series if we didn’t believe we would make it to the final, and there would have been no reason to prepare so hard for the tournament if we knew we were only coming to Brazil to make up the number. The 52 –year old, who played in the 1994 World Cup in the United States, said the Eagles would not underestimate the Iranians, saying they would not repeat the mistakes they made in the 1998 World Cup in France, where the players underrated Denmark in their Round of 16 clash.